Imagine that you feel tired, just have come back from gym or form office. And you want to eat some fresh, healthy, tangy and delicious food. I must say this is the perfect snack that you can make very quickly. 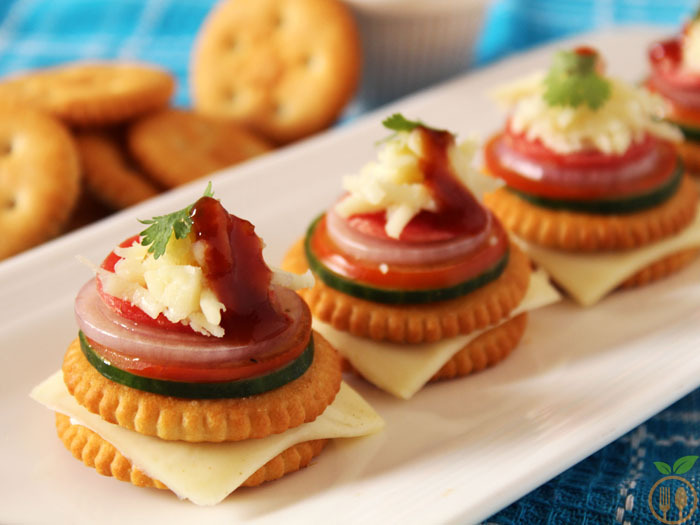 Though you are tired, you are going to enjoy making monaco biscuit canapes. Because you can make by your own innovations. 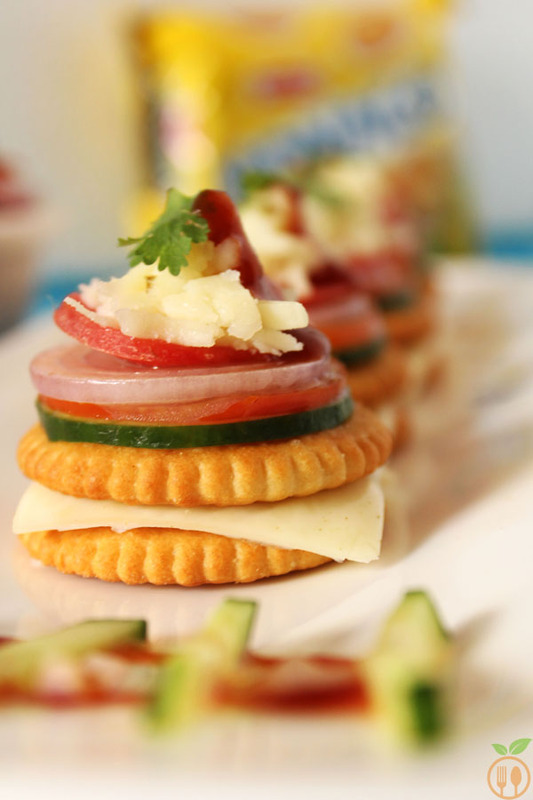 You can create toppings of your choice and with your biscuit canape ideas. So, you also feel relax while preparing it. When I was kid, my mom was very strict about eating any ready-made food or restaurant food. Even we have very limited chance for eating ready-made tomato ketchup. She always said “You should eat ketchup only twice in a month”. And I used to ask for Monaco biscuit toppings even knowing that my one attempt of having tomato ketchup would be counted. During my childhood, I enjoyed different versions of monaco biscuit canapes. 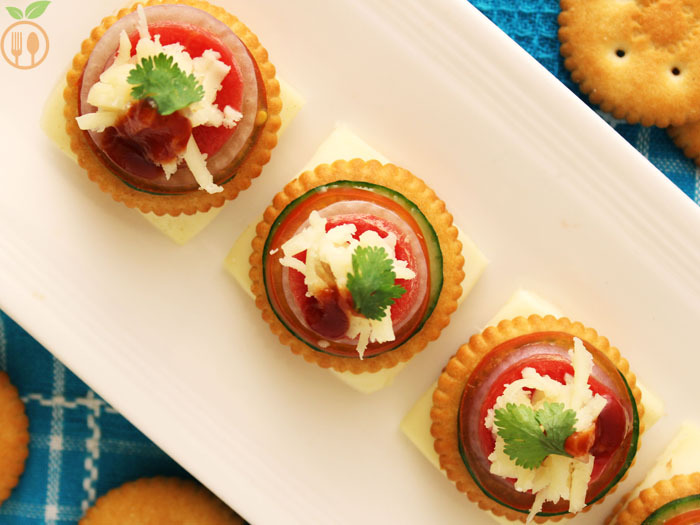 My mom used to find different ideas for canapes to make it healthier. She chopped all vegetables like onion, tomatoes, cucumber, carrots, cabbage then she put some chaat masala and tomato ketchup into it. She put paneer (cottage cheese) on top. So, I love that mom-made Monaco topping. while I am writing this right now, I can feel that taste in my mouth. This is best finger food, I have ever found so easy, tempting and quick. They look so appealing, and extremely light to eat. If you are planning some kids’ party or ladies kitty party, then this recipe makes you star of your party. Kids will love this recipe, as they can bite while playing, and no need to find place to sit while eating. You can serve it with any soft drink or mocktail. I prepared this recipe with slices of vegetables, but you can use very finely chopped vegetable for topping. For kids, this is very interesting recipe. They involve making this recipe, and creating with their ideas. That’s also make anyone can cook. You need to be careful while assembling. Don’t make this recipe prior if you are not serving it immediately after making. The main reason behind this is, your biscuits will become soggy due to moisture of vegetables. I have made 2 layers of biscuits, you can make as per your toppings and canape ideas. 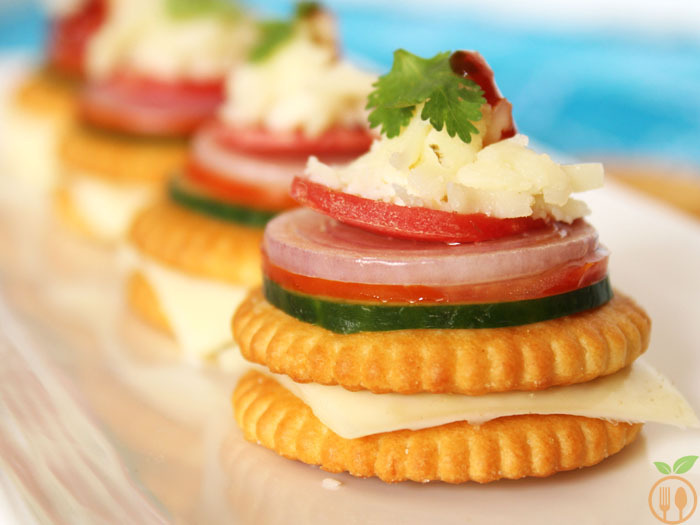 Monaco Biscuit Canapes - also known as Monaco Biscuit Toppings. It is a quick, tangy, tasty finger food and perfect for party snacks. It is relaxing and healthy snacks that no one can ignore, especially kids. Slice all vegetables using slicer or food processor. Take one cheese slice and make four small pieces from it. Now it’s time to assemble. take one biscuit put ¼ part of cheese slice and again put another biscuit on slice. Now take one by one slice of all vegetables. First put cucumber then sprinkle some chaat masala on it. then onion slice and tomato slice, again sprinkle some chaat masala and finally add carrot slice. At the top, put some grated cheese and also 2-3 drops of tomato ketchup and garnish with cilantro leaves. Finally sprinkle some chaat masala and ready to serve. 1) You can change amount of cheese in this recipe. If you want avoid the cheese, then also it tastes awesome. 2) You can change toppings as per your choice like you can also use boiled corn in your toppings. This looks so tempting !! can’t wait to try this..
Hi Yashika, I am happy to help you. I have 3 options that kids like most. 2. You can use oreio biscuits as base and try something white chocolate topping with sprinkles and more decorating stuff. This is sweet version.But you can use fruit to make it more interesting. 3. Use some chat stuffing, Use some sprouts to make it more healthy and add tomato ketchup to bind them together and use that mix as topping of any kind of salty biscuits. It tests yummy and also healthy version. I hope these ideas will enough for you. Please share me your daughter’s competition details. Will wait for your reply.. Thanks again by asking. I am always ready to share my ideas and recipes. simple recepie but looks so tempting!! Thanks for reading. I am happy to know that you liked it…!!!!! Can we use something else instead of that cheese slice.. Yes, Akshaya. You can simply avoid the cheese slice if you wanna make it more healthy. or you can use red chilli sauce instead of it make it more tempting. Nice.. I liked it.. What is the alternative for Cheese? Thanks for sharing your childhood recipe of having food at home.. Hehe I liked your ketchup story… very prominent role..
Looks tempting. Can I use tofu here? yeah, Shivangi.. Defiantly tofu will be good substitution for cheese. Is there any alternative for chaat masala? Yes Mimi, you can use pepper powder or rock salt.